Cargo space is always at a premium in a Jeep JK Wrangler Unlimited (4 door), and some of the cargo space that does exist is hard to use – for example, the space above the inner fenders in the cargo area of an Unlimited is curved, sloped and irregularly shaped, so it’s often wasted space. 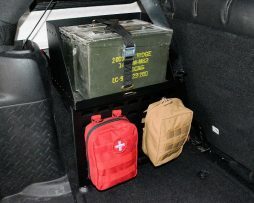 The MORryde Ammo Can Carrier is designed to use that space very effectively. 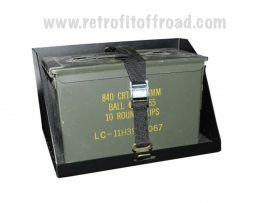 Bolted in place using the same holes that the hardtop is secured with (no drilling), the Ammo Can Carrier supports all common ammo can sizes and has a Molle grid for attaching common Molle-standard pouches and other gear. Being very rugged and waterproof, common uses for ammo cans on Jeeps include carrying recovery supplies (chains, recovery straps), tools or other gear needed on the trail. Virtually anywhere a jerry can or Rotopax(r) container can be installed, the Universal Ammo Can Tray can be mounted – it’s a great way to increase the cargo/storage capacity of your Wrangler. With its universal-mount design, the Universal Ammo Can Tray can be installed to any surface in the Jeep , including the floor or a roof rack, and many aftermarket accessories such as swing-away spare tire carriers. Having mounting provisions for either jerry can trays or Rotopax(r) mounts – the Universal Ammo Can Tray has matching bolt patterns for the Blitz/military jerry can tray and the Rotopax(r) mounting stud, so it can be mounted easily almost anywhere that has provisions for those mounting patterns.